Two Syrian al Qaeda-affiliated rebel groups this week called for terror attacks against Syrian civilians in retaliation for the mass killings by nerve gas near Damascus, according to U.S. officials. The jihadist rebel groups, the Al-Nusra Front and the Islamic State of Iraq and the Levant (ISIL), both of which are linked to al Qaeda, vowed on social media and Internet postings over the past several days to conduct the attacks on Syrian civilians linked to the ruling Alawite religious group, according to U.S. officials familiar with translations of the Arabic language web postings. Al-Nusra Front leader Abu-Mohammad al-Jawlani said in an audio message to the group Sunday that a military campaign has begun to exact revenge for the chemical weapons attacks on Goutah, near Damascus. Jawlani threatened to dispatch up to 1,000 rockets against Alawite villages in Syria and he also said the international community is to blame for the nerve gas attacks. The message stated that Al-Nusra Front would begin killing civilians as part of its "eye-for-eye" retaliation. The Alawites are a non-orthodox Shiite religious sect whose members for decades have controlled the Syrian government of Bashar al-Assad. They reside largely in Alawite Mountains on Syria’s Mediterranean coast. Military communiqués were then issued to Al-Nusra rebels and followed by assassinations of two Syrian leaders: Anas Naim, the mayor of Hama, who reportedly died in a car bombing attack Sunday; and Shaykh Badr al Din Ghazal, a Shiite cleric who had been captured earlier. Meanwhile, the ISIL released a statement on Monday promising revenge attacks for the chemical arms attacks that killed an estimated 1,400 people beginning Aug. 21. The ISIL said it planned to conduct "a volcano of revenge," with operations coordinated with other jihadist groups outside of Al-Nusra Front, which it regards as a rival rebel group, against Syrian government security bases, supply lines, and infrastructure in Damascus. The group also issued military communiqués announcing dozens of retaliatory attacks. The rebel campaign to attack Syrian civilians comes as the ISIL released a video Aug. 24 that showed three Syrian truck drivers being executed after they were identified as Alawites. A U.S. official had no comment on the Syrian jihadist rebels campaign against civilians. The calls for increased violence against civilians triggered a debate among jihadists over whether the killings of civilians are allowed under Islamic law. Some clerics have posted statements opposing the groups’ civilian targeting. Other jihadists cheered the groups’ announcements. The jihadists’ revenge campaign comes as the United States and several allies prepare to conduct bombing strikes against Syrian targets in response to the chemical weapons attacks that Secretary of State John Kerry said was a "moral obscenity." Meanwhile, a Paris-based Syrian opposition group reported on Monday that a high-level Syrian military defector met recently with a senior Israeli military planner and revealed that the United States has a list of potential missile and bombing targets in Syria. The Arabic language Al Haqiqah reported Monday that the Syrian defector from the Republican Guard, Manaf Talas, met recently with an Israeli officer on the planning unit of the Israeli military in Jordan after a meeting of military leaders there. 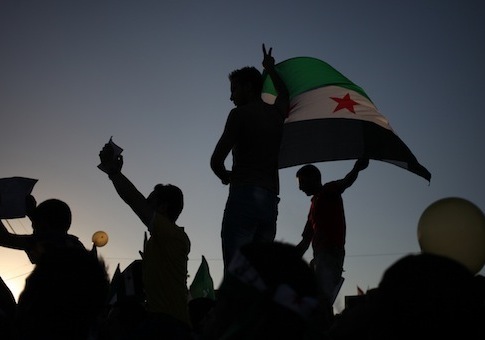 Talas is said to be a likely figure to help lead a post-Assad Syrian government. Discussions reportedly included sending military forces under Talas’ command to Damascus following a future military strike by the United States and allied forces on Syria. The report said military leaders involved in strike planning are concerned with a complete breakdown of order in Syria following a future missile and bombing strike, especially in Damascus and surrounding areas. Israel is said to be worried that Hezbollah will launch attacks on Israel after such strikes from bases in Lebanon. Israel’s government said on Tuesday it is ready to react to any attacks as a result of retaliation from a future missile strike on Syria. This entry was posted in Issues and tagged Al Qaeda, Al-Nusra, Israel, Middle East, Syria. Bookmark the permalink.